Father John Reve was the young village priest at the tiny village of Oakham in Somerset in the 15th century. It was when his mother had died in a fire, "that grief led me to want to be what she'd wanted me to be, and I began my training for the clergy." When a parishioner tells him, "Any parish with a priest like John Reve will be looked on kindly by God ... You're God's word to us and his wish, you're next to Jesus", he cannot help but wince. He sees "few enough signs from God" and feels that "for all that he's overseen by Christ, he's led his people to no further illumination." Despite attracting a full congregation, and the general respect of all the villagers, he cannot but worry about his own inadequacy. He is lonely too, as his sister has recently left him to get married and the woman he thought he loved is painfully dying. He narrates the story throughout. 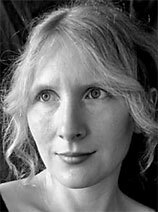 Samantha Harvey (1975 - ) has lived in Ireland, New Zealand and Japan, writing, travelling and teaching. She completed with distinction the Bath Spa Creative Writing MA course and has also taken a postgraduate course in ﻿philosophy and a PhD in Creative Writing. The Western Wind (reviewed below) is her fourth novel to be published and, like all her books, has been widely praised by critics and nominated for numerous awards. She lives in Bath and is a Reader in creative writing at Bath Spa University. The Western Wind is set in 15th century Oakham, in Somerset, a tiny village cut off by a big river with no bridge. When a man is swept away by the river in the early hours of Shrove Saturday, an explanation has to be found: accident, suicide or murder? The village priest, John Reve, is privy to many secrets in his role as confessor. But will he be able to unravel what happened to the victim, Thomas Newman, the wealthiest, most capable and industrious man in the village? Although he dutifully questions all concerned, this is really a pretence as it turns out that he knew exactly what had happened all the time, and this was his guilty secret. The story is actually told backwards beginning on Day 4, Shrove Tuesday, 17 February 1491, and ending on Day 1, Shrove Sunday. All this can become rather confusing for the reader, but the author's intention is to explore the priest's character (he emerges as a highly insecure, struggling, yet highly caring individual) and reveal the realities of human experience In this poverty struck squalid little village "of scrags and outcasts" where "children were outside playing catch-me with a dead chick" This she does quite brilliantly, attracting the reader's attention right from the start. It is a world where Reve well knows that "My people are superstitious and have always been. They live in wariness at the whims and punishments of God and take everything as a warning ... He'll send wolf-men from the northern forests to eat our children, and he'll multiply the grotesque creatures who swim in oceans that never lap a second shore ... I tell them: No, no, those aren't the things to fear, we've come too far for superstition. We know there are no wolf-men and no sea creatures of that kind ... There are only spirits - ill-meaning spirits, who live as we all do on God"s earth but aren't made by God ... They're what we wrongly call luck, ill or otherwise - because luck has nothing to do with God, who decrees with certainty and reason and whose will can't be fought; we're born already conquered by him. But the spirits, we can conquer." So he prayed "for wind to come from the west and blow afield this searching of the spirits eastwards, towards God. Overnight the wind came, though it was from the east, and sharp, and wintry. Maybe he hadn't heard the whole prayer, busy as he was." Reve himself is ever aware of his priestly responsibilities: "You're a man trying to do an angel's work. In time, you carry each and every soul in your parish across the bridge, from death to the next world." It is an awesome responsibility and Reve struggles to cope. The individual villagers come to life, as does the inquisitive little dean who had come to the village to look into the sudden death and had "a nose for the nasty". It is he who suggests that Reve should lure the murderer to confession to offer him pardon: "I can tell you there are plenty of people who need it, murder or not. You aren't a village that's going to crowd heaven. Do you know purgatory has a waiting room? They call it Oakham, there are so many of you there." it would be pushing things to make too much of Reve as a clerical detective but the book is indeed a memorable one. The author has her own website. The handsome cover does not give anything away.